Eastpointe is a city with 34,077 residents and an area comprising 5.1 square miles located in Macomb County in southeastern Michigan. Its southern boundary is Eight Mile Road, which is also the dividing line between Macomb and Wayne Counties. Eastpointe proudly boasts itself as the “Gateway to Macomb County”. 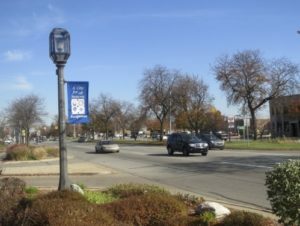 Eastpointe shares its borders with the cities of Detroit and Harper Woods on the south, Warren on the west, Roseville on the north, and St. Clair Shores on the east. Eastpointe is an excellent residential community of high quality predominantly brick homes, most of which were constructed during the past 30-40 years and are well maintained. There are ample shopping areas, business and professional establishments within and near the city to serve its residents well. Eastpointe is conveniently located to downtown Detroit, as well as to large industrial and manufacturing areas in the cities of Warren and Sterling Heights. Lake St. Clair, Metropolitan Beach, and other recreational facilities are also nearby. The city has wide concrete residential streets, efficient police and fire protection, a fine public library, excellent recreation facilities, and a quality water system and provides all municipal services courteously and efficiently. Eastpointe is served by the East Detroit Public Schools, South Lake Schools, and Macomb Intermediate School District. The city also has excellent parochial school systems and many churches of leading denominations. The community was founded by European immigrants who came to establish homes in the New World. From 1837 to the present time, this community has operated under three forms of local government, i.e. Township, Village and City. The name first given to the area in 1837 was Orange Township. In 1843 the area was renamed Erin Township; both names indicating that the earliest settlers were Irish. The Irish were followed by pioneers from Bavaria, Macklenburg, Saxony and other provinces of Germany. The German migration began in the early 1830’s and soon became the majority of the settlement. The Township form of government lasted until December 8, 1924, when the Village of Halfway was incorporated. The name Halfway was first officially recorded in 1897, with the opening of the Halfway Post Office. This name was given to the community in the early days when the Halfway Inn was a regular stopping place for stagecoaches traveling between Detroit and Mount Clemens. The phenomenal growth in the village during the next five years qualified Halfway for city status. The name was changed to the City of East Detroit on January 7, 1929, when by a vote of the people it was incorporated as a Home-Rule Charter City with a Council-Manager form of government. Over the years, the community realized that they suffered a lack of identity as the city was often confused with its larger neighbor, Detroit. On July 1, 1992, the City of East Detroit became the City of Eastpointe by Charter amendment subsequent to a majority vote of the electorate. Originally what is now Gratiot Avenue was an Indian trail through the wilderness. In 1827, the army surveyed the roadway and by 1835 built a “corduroy-type” road. Logs were cut on the right-of-way and laid crosswise to elevate the road above water. The military road led from Fort Wayne in Detroit to Fort Gratiot (now Port Huron). In 1850, a plank toll road replaced the original corduroy road. The toll was one cent for each horse. Gratiot Avenue is now an eight-lane concrete highway, with a beautiful parkway from Eight Mile to Fourteen Mile Road. Nine Mile Road, which for years was a country dirt road, has been a gravel road, a narrow blacktop road, and now a modern five lane concrete street. Source: Official Website of Eastpointe, MI. Copyright © 2016 (Eastpointe, MI). All Rights Reserved.